Patterson Veterinary strives to be your single source for everything your cattle, sheep, poultry or swine practice needs. From pharmaceuticals to equipment, we will provide you with the service and tools that help you provide the best possible care to your patients. In addition, our combined business with Animal Health International, offers a broad product base that includes over 1,000 manufacturers who supply products focused on beef and dairy cattle, poultry and swine. In addition, our combined companies offer beneficial niche products from select international, national, regional and local suppliers which provides a unique and specialized breadth of products. Our production animal Territory Managers are in constant contact with livestock producers, veterinarians and dealers to assure that product needs are met and your questions are answered. Our Territory Managers work to become a vital part of your business through building long-lasting relationships and providing outstanding customer service. We pride ourselves in knowing our customer, their industry and how they succeed in their business. For a robust catalog of production animal supplies, please visit Animal Health International. 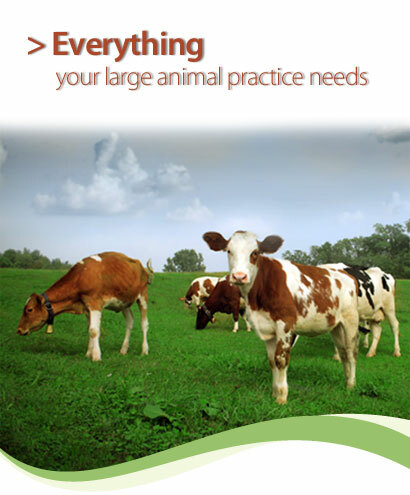 To find answers to your questions about large animal products, call Patterson Veterinary at 800-225-7911.